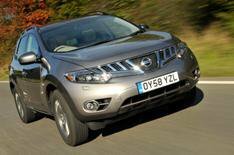 Driven: Nissan Murano | What Car? A 3.5-litre petrol 4x4 with fuel economy of 25.9mpg and belching out 261g/km CO2 doesnt make an awful lot of sense at the moment. Leave the running costs aside for a minute, though, and the face-lifted Murano looks quite good value when you consider what you get for the money. A leather interior completes a luxurious standard kit list including sat-nav, two sunroofs, electric drivers seat with memory settings and an 11-speaker Bose audio system. Its practical, too, with rear seats that fold flat in one move, leaving a large flat boot. The engine itself is strong and refined, although it doesnt feel quite as powerful as you might expect, partly because the peak torque of 246lb ft doesnt arrive until 4400 revs, and also because the automatic CVT gearbox is rather too keen to allow the revs to drop below this figure. However, its quiet enough not to be heard in the cabin unless you accelerate hard, and road noise, too, is kept at bay on all but rougher surfaces. Its a shame, then, that the car tends to fidget over bumps and wallows on corners, which isnt a problem for town and motorway driving but compromises its ability and comfort on twisty country roads. The new Murano is likely to look a lot more appealing once the diesel version comes out late next year; until then, plenty of rivals make a better buy.